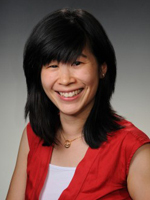 Eunice Chen, PhD, is an Assistant Professor in Psychology at Temple University and runs the Temple Eating Disorders program. After receiving her PhD in Clinical Psychology from the University of Sydney, Australia, she completed two Postdoctoral Fellowships, one with Kelly Brownell, PhD, at Yale University and the other with Marsha Linehan, PhD, ABPP, at the University of Washington, Seattle. Prior to this, she was an Assistant Professor in Psychiatry at the University of Chicago where she ran an adult eating and weight disorders program. Her primary research interest is the etiology and treatment of individuals with eating and weight disorders. She has developed Dialectical Behavior Therapy for individuals with eating disorders for whom standard treatments fail (e.g. non-responders to Cognitive Behavior Therapy, individuals with eating disorders and co-occurring disorders, and adults with anorexia nervosa). In the process of conducting trials, she has trained therapists in the use of DBT with eating disorders.